Pointing to migrants from the world’s poorest countries who were granted refugee status in Europe, Avramopoulos made clear that Brussels sees asylum not as a way to offer temporary respite from war but instead as another method of permanently transplanting third world populations into EU nations. “They have found safety in Europe, but we also need to make sure they find a home,” he writes of refugees, going on to insist that programming Europeans to welcome mass migration is “not only a moral imperative”, but “also an economic and social imperative for our aging continent — and one of the biggest challenges for the near future”. To this end, the Commission is working to “enhance legal channels for economic migration with a more ambitious Blue Card for highly skilled workers and kick-start targeted labour migration pilot projects in key third countries”, he notes. Whilst Brussels claims that the Blue Card will bring “highly-skilled workers” to Europe, Breitbart London reported last year that revisions to the scheme clearly contradict this, stating that it would be necessary to provide newcomers with education, employment, and vocational training. Noting that people from non-European backgrounds living in Europe are much more likely to be unemployed or on low wages, the Commission even stressed that “integration measures” would be necessary for hosting the arrivals they claim are essential to the continent’s economies. In the piece, the Greek politician also praised a series of POLITICO articles which accuse the EU of being “too white”, in which the bloc was urged to bring in measures which would encourage replacing native Europeans with “people of colour” in Brussels jobs. But this, the migration commissioner said, is “not nearly enough to prompt the changes that our societies need to be ready for the realities of the 21st century”. 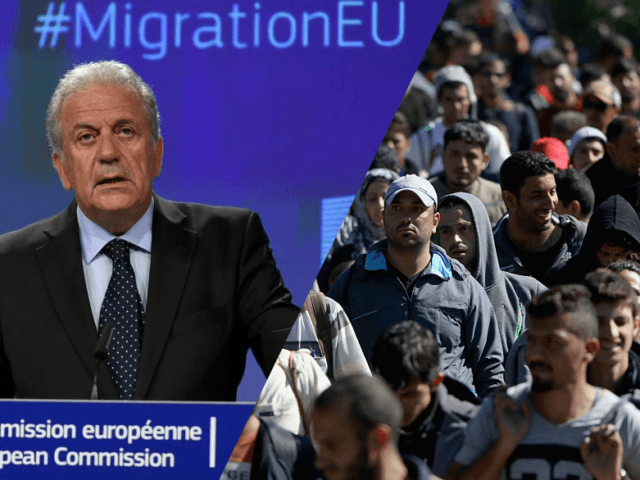 Avramopoulos, who last week shot down European Council chief Donald Tusk’s suggestion to scrap the controversial migrant quota scheme forcing third world migrants on unwilling nations as “anti-European”, went on to make clear he believes that no corner of the EU can be exempt from mass migration. “It is naïve to think that our societies will remain homogenous and migration-free if one erects fences,” he thunders, in a paragraph clearly aiming at nations in Central Europe, where leaders have fought against the imposition of third world migration. “At the end of the day, we all need to be ready to accept migration, mobility and diversity as the new norm and tailor our policies accordingly. “The only way to make our asylum and migration policies future-proof, is to collectively change our way of thinking first,” the migration commissioner concludes.